The global color cosmetics market stood at USD 57.4 Billion in 2014 and it is expected to reach USD 77.7 Billion in 2020 with a CAGR of 5.7%. Color cosmetics have wide applications in nail products, lip products, eye make-up, facial make-up, and other. Color cosmetics refer to the colorants and cosmetics ingredients that help to enhance the appearance of the human body. The color cosmetics include products such as eye shadows, foundations, nail paints, lipsticks, powers, and others. The color cosmetics are segmented on the basis of target markets such as prestige products and mass products. The prestige products are projected to register high CAGR than mass products in the next five years as the brand loyalty amongst prestige color cosmetics users is rising especially in the developed regions. The rising disposable income of people, rising consciousness about appearance, and improving quality of life are the major drivers of the color cosmetics market in the developed countries of North America and Europe as well as the emerging countries of Asia-Pacific and RoW. Moreover, the growing demand for beauty and personal care, organic cosmetic products, technological advancements in color cosmetics, attractive packaging, increasing consumer health awareness about personal care and fashion trends are projected to drive the demand for color cosmetics. In Asia-Pacific, China and India are expected to witness high demand for color cosmetics between 2015 and 2020. The Chinese color cosmetics industry is the most promising industry in Asia due to changing consumer demographics towards a younger and more affluent segment. In India, the demand for facial make-up, nail and lip products, hair products, and other beauty products is expected to register a high CAGR between 2015 and 2020. This growth is projected to be mainly driven by increasing access to branded products, rising affordability of the female consumers, and rising consumer base. This report estimates the color cosmetics market size in terms of value, regionally and in end-user markets. The report provides a comprehensive review of the important drivers, and challenges in the market. This market is further segmented and forecasted for key regions, such as North America, Europe, Asia-Pacific, and RoW. Top players of the industry are profiled in detail with their recent developments and other strategic industry activities. The segmentation by type of color cosmetics in terms of consumption and value for each region is also discussed in this report. This report also includes the leading manufacturers’ profiles, such as L'Oréal Group (France), Estée Lauder Companies Inc. (U.S.), Avon Products Inc. (U.S.), Coty, Inc (France), Revlon Group (U.S.), and others. The color cosmetics are personal care products that enhance the physical appearance of a human body. They mainly refer to colorants and cosmetics ingredients that are used for skin care, make-up, hair care, personal hygiene, fragrance, and oral care. The color cosmetics include products such as foundations, nail paints, powders, lipsticks, bronzers, eyeliners, and others. The color cosmetics flourished in 2012 with the launch of new line of beauty brands that has gained immense customer loyalty. The nail products have been the fastest growing category which has been spurred by innovative textures and effects. The facial make-up segment also witnessed growth due to several skin and anti-aging benefits incorporated into concealers and bases. Color cosmetics can be divided on the basis of their target market prestige products and mass products. The demand for prestige products as well as mass products is witnessing a rapid increase in the developing countries of Asia-Pacific. Moreover, the benefits associated with the prestige products are attracting more costumers to shell out extra and at the same time is garnering customer loyalty. 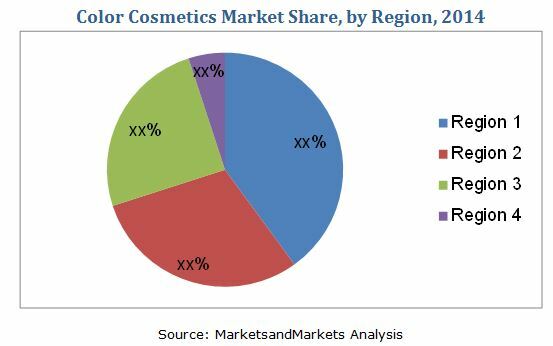 The demand for color cosmetics is expected to register higher growth in the lip products, facial make-up products, nail products, and eye make-up products. The multi-benefit products are driving the color cosmetics market that provides additional characteristics such as anti-aging benefits and UV protection. This industry is highly dynamic which demands product differentiation and the manufacturers experiment with new textures and formats to survive in the competitive market. The facial make-up market is registering fast growth and manufacturers are creating foundations that incorporate light-capturing crystals. With the rise of products for instance, anti-aging foundations, the foundations are being formulated with better skin care formulas. The lip care category is becoming more lucrative by offering products that combine shimmering, shiny textures with a long-lasting and caring formula as well as is contained in a stick form for ease of application. The color cosmetics market is anticipated to show a high growth rate in the coming years. Applications such as lip products, facial make-up, nail products, and hair color products are predicted to show higher growth than other applications. The global color cosmetics market demand, by value is estimated to reach approximately USD 77.70 Billion by 2020. Increasing consumer incomes, rise in awareness about personal care products, increasing consumer spending in color cosmetics, innovations of new products to cater to rising demand, rise in consciousness about appearance, growing beauty and personal care segment, and the rise in demand for color cosmetics to reduce age related imperfections is driving the market for color cosmetics. This trend is projected to continue for the next five years. The rising financial stability of women and financial independence in the developing economies of Asia-Pacific such as China and India is projected to drive the color cosmetics market in this region. North America and Europe are the leading regions for the consumption of color cosmetics. However, Europe and Asia-Pacific are projected to have the strongest consummation rates and dominate the color cosmetics market by 2020. The U.S. holds the largest share in the North American market while France holds the largest share in the European market. Asia-Pacific and the RoW regions are showing a significant increase in demand of color cosmetics. Color cosmetic companies focus keenly on research and development to provide innovative and high quality products and solutions to its customers. Besides, these companies also aggressively collaborated and venture with other companies to increase their presence in different regions. These two are the major strategies adopted by the companies to strengthen their position in the color cosmetics market. 11.5 The Estée Lauder Companies Inc.